2016 concluded with the traditional Year End Congresses, held in London and Blackpool - the latter hosting again after a two year break when the congress was at Dunkenhalgh. The congress in London started with a three session Stratified Swiss Pairs. This was won by Gunnar Hallberg & Phil King (both London) (see picture here), who won nine of their eleven matches and finished on 163 VPs. Frances Hinden & Graham Osborne (both Surrey), who lost only one match, finished second with 159 VPs. Frances and Graham defeated long-time leaders Martin Garvey & Jeffrey Allerton (both Surrey) in the final match, resulting in Martin and Jeffrey slipping to third place with 155 VPs. The leading 'B Stratification' Pair were Peter Taylor (London) & Richard Hillman (Middlesex) who finished 8th= on 140 VPs. The junior pairs of Nicholas Dean (London) & Dominic Rayner (Yorkshire), who finished 10th=, and Liam Sanderson (London) & Daniel Winter (Yorks), who finished in 17th=, were the highest 'C Stratification' pairs, but as they also finished high enough to win 'B stratification' prizes, the prize for the top 'C Stratification' pair went to David Stern & Howard Jennings (both London) who finished in 40th=. The first day also featured a Really Easy Afternoon - a competition for less experienced players, held at different venues around the country. This was won by Kay Vowles & Geoff Vowles (both Herts) who played at First Class Bridge Academy in Billericay. Graham White & Mary Cousins (both Yorks), who played at Sheffield Bridge Club, were second, and Lynne Ringuet & Sandy Wiggan (both Surrey), who played at Richmond Bridge Club, were third. The leading 'B Stratification' pair were Susan Cummins (Middlesex) & Elisabeth Guest (London), who played at Richmond BC and finished in 11th. The middle day of the congress featured an Open Pairs and Mixed Pairs. The former was won by junior internationals Ben Norton (Leics) & Daniel Winter (Yorks) (see picture here) who finished on 57.50%. Philip Town (Middlesex) & Neill Harcus were second with 57.19%. The Mixed Pairs was won by Szczepan Smoczynski & Gitte Hecht-Johansen (both London) (see picture here) with 60.32%, narrowly ahead of Lee Rosenthal (Middlesex) & Marcia Green (London) who scored 60.19%. 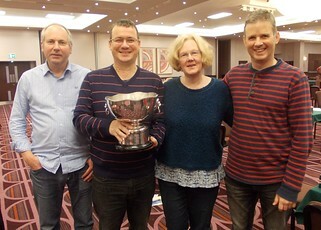 The event concluded with a Stratified Swiss Teams which was won by Neil Rosen, Anne Rosen (both Middlesex), Jeremy Willans & Ian Draper (both Kent) (main picture) with 106 VPs from seven matches. They led the defending champions - the team of Jon Cooke (Cambs & Hunts), Paul Lamford, Simon Gillis (both London) & Erik Saelensminde - by 3 VPs before the two teams played each other in the final match. The Gillis team edged a low scoring match, to win 11-9, and the Rosen team therefore held on to top spot. David Kendrick (Cambs & Hunts), Tony Waterlow, Jerry Harouni and Ray Robinson (all Middlesex) were third on 99 VPs. The winners of the 'B Stratification' prize were David Landes, Jeff Harris, Russell Spiro (all Middlesex) & Stuart Leigh, who finished in 16th. They were also eligible for the 'C Stratification' prize, which was therefore awarded to Alex Birchall (Manchester), Will Roper, Ambrose Holmes-Mackie (both Wilts) & Niall Igoe (London) who finished in 37th= of the 83 teams.